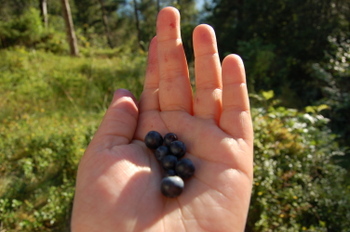 The blue fingers of Leander picking blåbær. The blue mouth of Leander eating blåbær. The wild blueberry plants are blooming, the weather is warm and the bumblebees are busy. The blueberry season seems to be a very good one this year. After no posts since October, The Blue Cafe opened again today. I plan to post food from the nature the coming months. August. Saturday. Perfect weather for hiking. so can a family with children happily playing. All of it music to my ears. Feet dancing a blueberry tango. and then I know I will make blueberry pancakes for lunch! 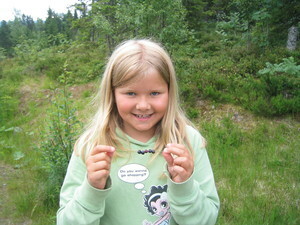 Marta and her friend, Ingrid and Terje were out catching crabs last night, together with my brother in law. from another crab catching adventure. 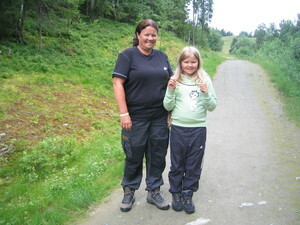 Hm, somehow typepad won´t let me post the photo.....so you´ll have to go to the old post to find it. I don't wear make-up. No mascara, no lipstick, no eye shadow, no perfume. Though I do use a deo, I love soaps and buy exclusive ones when I travel, I have an olive oil cream for dry skin........and come to think of it, some days I do wear make-up, on my right hand thumb and index finger. 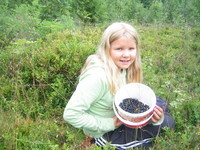 We were out picking blueberries yesterday, Terje and I. In the hills right behind our backdoor. Two buckets, two berry pickers, a backpack with a thermos filled with coffee, a few cookies, a bar of chocolate. It didn't take long to get perfectly blueberry stained fingers. Impossible to wash off, so today I wear make-up. On two fingers on my right hand. Cloudberries on Saturday, blueberries on Sunday.......and Sunday night, while I enjoyed my greenhouse, Terje picked black currant in our garden and made a ton of marmelade. Harvest time. Sun. Countryside. Nature. 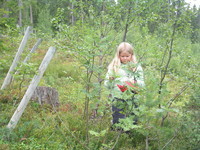 Today Terje and my parents will pick more blueberries. I haven't decided yet if I will go with them, or if I will sit outside my greenhouse to watch the tomatoes grow. 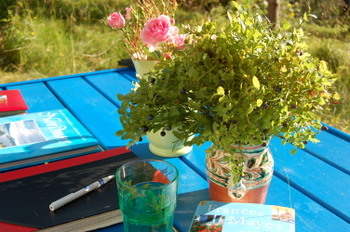 Blueberry season and travelling like Frances Mayes. 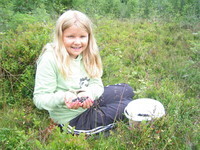 The blueberry season has started, which means that Marta is in seventh heaven. 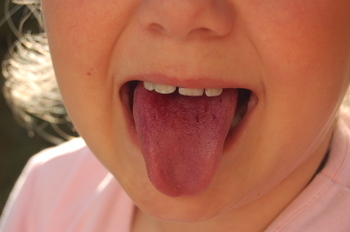 Our cabin is placed right in the middle of a blueberry hill, and though it is usually quite dry there which means fewer berries, there is always enough to make a 10 year old tongue perfectly blue. Can you imagine more perfect images than a child's hand filled with juicy, blue berries, and the same child putting out her tongue as far as she can, crossing her eyes, trying to catch a glimpse of the sweet and tasty blue colour. We love the west side of our cabin where we can enjoy the late evening sun. A few pieces of furniture placed on random, glorious nature as far as we can see. Sunday night I was planning our day trip to Smøla, and Isat there surrounded by books and travel diaries. And in between I read pages from Frances Mayes' latets book, "A Year in the World". Now, almost 10 years after discovering Frances Mayes' writing, I still remember how it was to read "Under the Tuscan Sun" for the first time. At that time I had only been to Italy once, and travel litterature was a genre almost new to me, so the book opened up a new world. I had started to write my own travel diaries already then, I have quite a collection of them now. But Mayes taught me a totally new way to see things. I know that some people don't like her new book where she tells about alot of different travels. It can at times be too sketchily, only scratching the surface, and too much "just seeing the tourist part" of a place. Still there is something with her writing that hit my travel genes in a way that make them play a totally new song. The way she reflects on what she sees, the way she tells about authors and artists connected to the places she visits, the way she love to play with rare words to describe her experiences and feelings. I love it, and it makes me want to write myself, which I am doing more and more. Now I never go anywhere without a notebook, a diary or a sketch book. And when you first start to travel write, or photograph seriously, a new world opens. You see new and old places with fresh eyes, and travelling becomes a passion you can't live without. Travelling for me is not necessarily to go to far away and exotic places. Travelling for me is to sit in my office and look out the window, it is the bus ride I do to and from work, it is a hike in the countryside behind our house, it is two weeks in Laos or a week-end to Prague. Of course my "art of travelling" could have developed without Frances Mayes, still, I know in the deep of my heart that I have alot to be thankful to her for. And I soon need to buy new copies of "Under the Tuscan Sun" and "Bella Tuscany". The ones I have are read over and over again and are worn out. 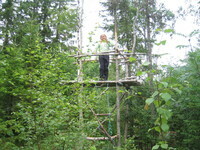 Though we live in the third biggest city of Norway, Trondheim, we still live on the edge of the forest. I love this change between city life and country life, and use the forest and the countryside alot. 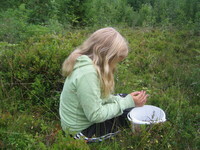 I am working this coming week-end (with programs in connection with the St Olav Festival) so when Marta asked a few days ago if we could go searching for blueberries, I decided to take today off. I went to a midnight mess in the cathedral last night, so I slept long this morning. 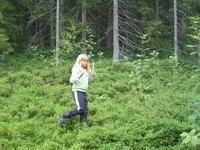 But after a late breakfast I packed my backpack and we were ready for blueberry hunting :-). I had been out the night before to look for the berries and found that we rally didn't have to go long to find the perfect blue blueberry fields. And right up the hill we decided to start picking. And suddenly three hours had passed, our lunch was eaten, our buckets was filled and our fingers were all completely coloured by blueberry stain. Marta loved it all, and now she is looking forward to Sunday. Then her dad has promised another visit to the same hill with empty buckets. We woke to a perfect Sunday, mild, quiet and no program ahead of us. 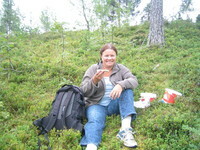 The three of us, me, Marta and Terje, had breakfast, and then we decided for a walk in our forest. Packed a backpack with water bottles, coffee and sweet buns from the freezer and started. Marta wasn't too motivated for the hike, she would rather sit in front of the television, which we of course wouldn't allow on such a nice day. 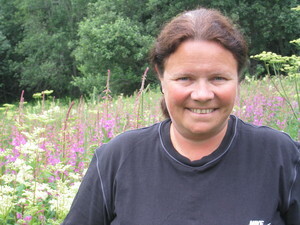 But we hadn't walked long before we found the first ripe blueberries, and a smile broadened on her face. 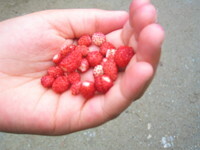 She loves wild berries, and of course the first ones of the season taste especially sweet. She found a straw and started to collect. It is a bit to early for berries here in Trondheim, but we were able to find enough to help her fill her straw. But our hike went on. 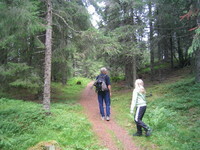 I especially love to hike on narrow and dark paths like the one Terje and Marta are hiking on in the photo. 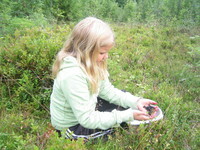 A little later we were lucky and found some wild strawberries, an other treat for Marta. The Sunday morning hike was a perfect start for hours in the garden. First garden work, then a barbeque. Tomorrow is workday again, but the weather forcast has promised very good weather, so the afternoon will be spent in the garden.